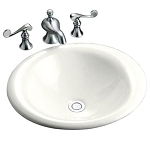 Browse through our selection of bathroom sinks! We carry a variety of styles including undermount, stainless steel, above counter, boutique style, pedestal, and more. Choose from brands such as Kohler, Whitehaus, Schon and more. Visit our discount appliance outlet to see our full inventory in High Point, NC today!